I decided to build a printer using only the LEGO Mindstorms EV3 31313 set. I’ve seen a lot of attempts on the internet, but the one designed by Ralph Hempel seemed to me as the best. I won’t go deep into all the steps in details, only those tricky ones. If you have any ideas, questions or answers, feel free to post them! The machine is complex, therefore, if you had to build this printer from scratch, this could take some time. Luckily we don’t have to! 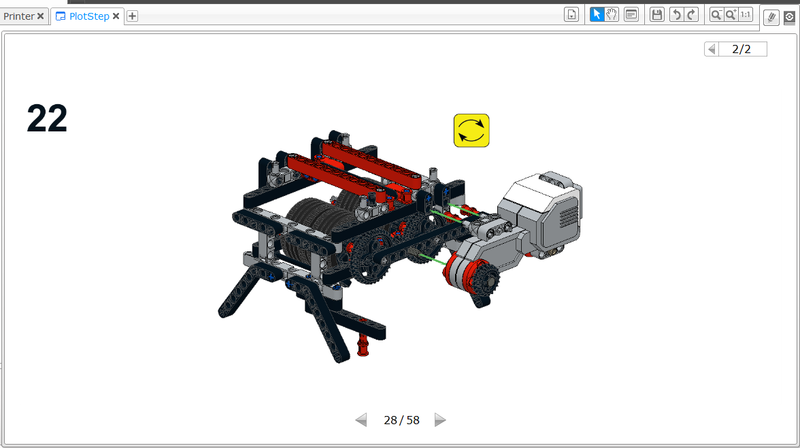 Building instructions can be found here and downloaded directly to your EV3 programming environment. 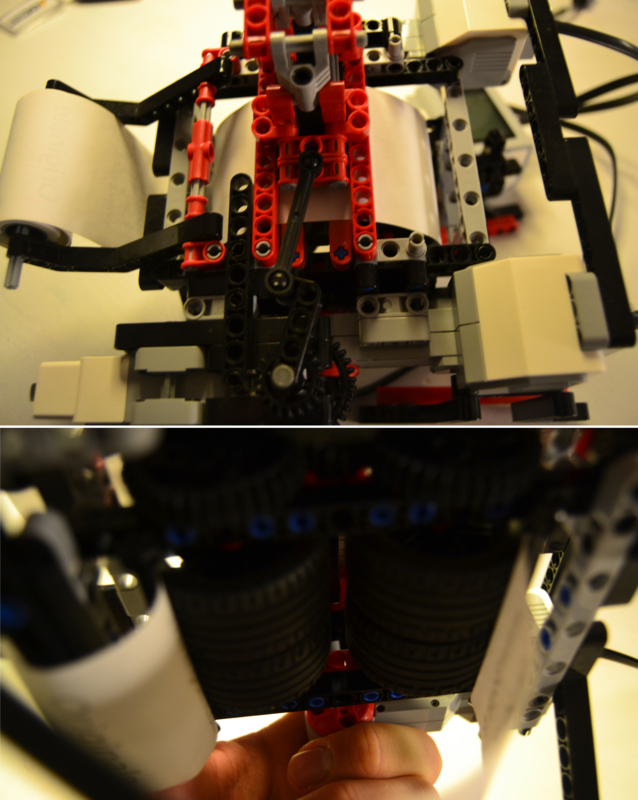 Ralph has made the instructions consisting of 58 steps, together with Philippe Hurbain, a notorious NTX and Ev3 designer. The same procedure goes for this step. The code for the motors is in the same file but it is good to know a little about what it does. The printer consists of three motors. The A-motor moves the pen up and down the y-axis, the B-motor lifts and lowers the pen and the C-motor moves the paper back and forth the x-axis . These three motors all works together at the same time. They have to be perfectly synchronized (though i doubt that it is the case all through…more about that later). I discovered a bug when printing “CODING PIRATES”. The letters of the print were curved instead of linear and the bottom of the letters were lower than the top. 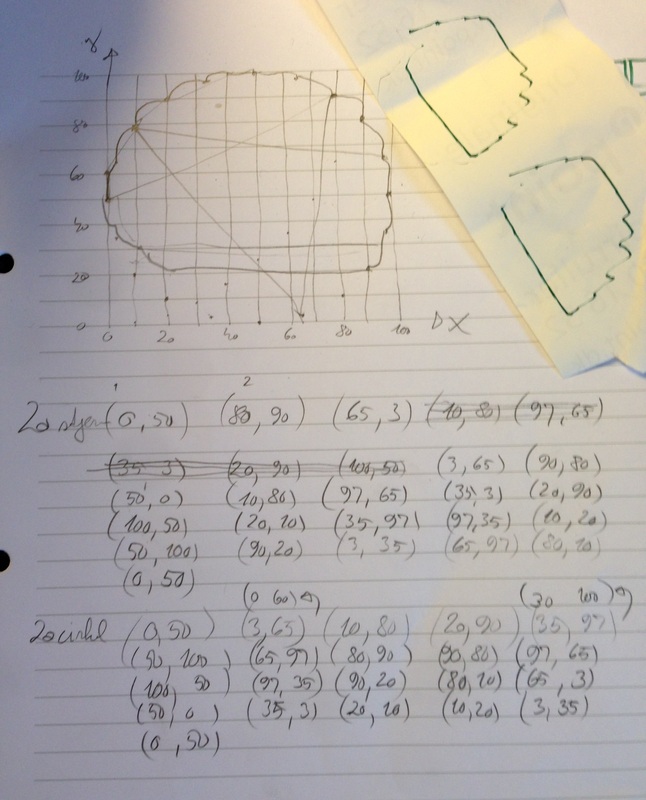 The pen seemed unable to draw lines that were using y-coordinates lower than 30. Instead it draws a horizontal line. This could be of many reasons. One could be the start position of the pen. Ralph recommended me to position the pen in the far position. 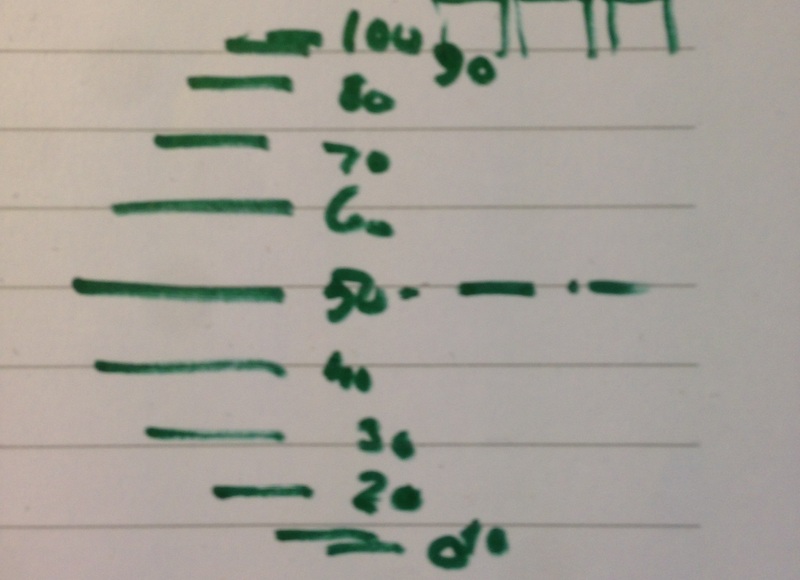 But this gives the pen a start position that is approximately the y-coordinate 70 and unable to go lower than y-coordinate 30. If I instead put it in a start position that are closer to the middle (y-coordinate 50) it should be able to cover a wider spectrum. I then tried to make the printer draw a star with 20 edges, the result was really poor. To test the thesis, this it my predicted outcome of the print of a circle based on the same 20 coordinates from the star with 20 edges. In the upper right corner is the printed outcome of the circle. As you see, the prediction came pretty close. Also it could be that the x and y-motors aren’t completely synchronized. It looks like the y-motor (the one moving the pen) somehow moves before the x-motor (the one moving the paper). I am not sure if this has been taken into account in the code. The solution could be a piston of some sort? My next move would be to code the entire alphabet (including common signs) and create a function that recalls the letters, so I won’t have to copy paste the coordinates every time. This way it could almost be like a real printer. 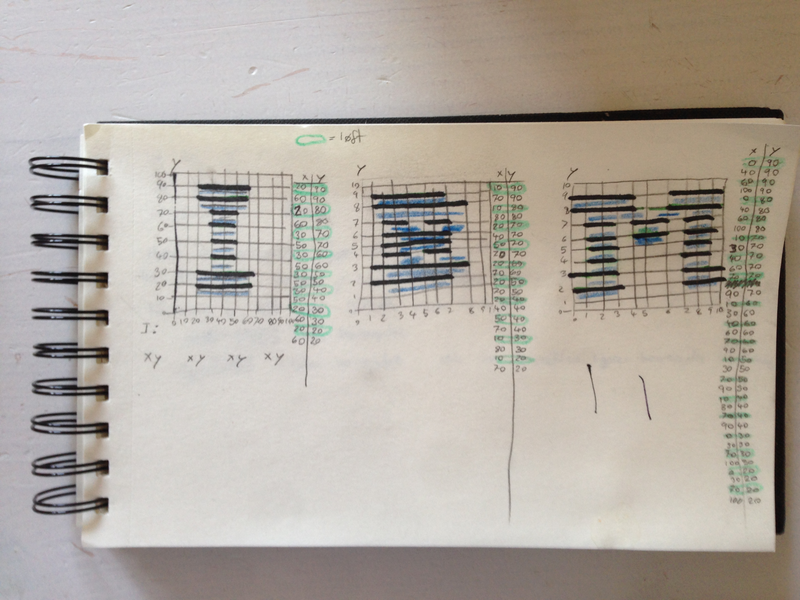 I would like it to print four letters in the horizontal lines. This will enable me to print more on less paper. Ralph Hempel did a fantastic job when he originally designed the plotter. He btw. is a clever and creative guy and interesting to follow. At this moment he is working on putting a Debian Wheezy on the EV3 brick, so that you can program directly to the brick using conventional programming languages and without using the official IDE that he thinks is buggy (And I agree!). You can also cut your own paper from credit card, or connect 7 mindstorm beams together. My pen area is just falling off when i run program. Why? I am trying to program my banner printer. I do’nt really get the steps. could you please send me the code for it. I can’t see it really well in the picture.